So what’s on your party menu for watching the big game? We’ve put together the following items, which go beyond bowls of corn chips, pretzels and cheeses. We make no specific claims about their healthiness, so pace yourself! Your final menu choices will depend on how much prep work you feel like doing for your party. These are the snacks that are easy to put together, and mostly require minimal effort. Garlic bread or Pull Apart Cheesy Garlic Bread is great fun for a party and will disappear fast. Meatballs. 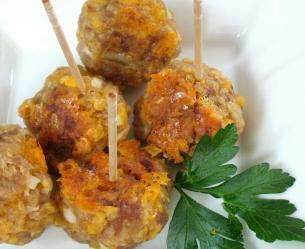 Little Sweet and Sour Meatballs served with toothpicks or Sausage Balls(shown below) are always a crowd pleaser. Mushroom caps. For a change of pace, try these bacon Stuffed Mushroom Caps(video). Chicken wings. Make chicken wings in the oven for an easy-to-prepare football snack that everyone will appreciate. Serve with the traditional sides — thick blue cheese dressing, celery and carrot sticks, hot sauces, and a fistful of napkins. Grilled sausages. If the weather’s still good (or you’ll grill in the snow), fire up the backyard grill and throw on some nice Italian or Polish sausages. Nachos and cheese dip. “Guilty pleasure food” at its best with this 2 ingredient nacho cheese dip. Potatoes. Potato wedges a really inexpensive snack are great with ketchup or sour cream. Stuffed potato skins. 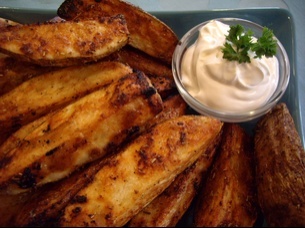 Or if it’s not wedges, it’s potato skins, which can be assembled ahead of time for baking. Make sure to set out extras, like sour cream, chopped chives, crumbled bacon, and grated cheese. Classic cheese ball. Need I say more? Serve cheese balls with a variety of crackers or thinly sliced pumpernickel bread. Chex mix. There are an endless number of combinations to the snack most of us know as chex party mix. Customize the recipe to your liking, but keep an eye on the oven, as the onion powder tends to burn easily. If you’re feeling slightly peckish instead of all-out hungry, here are a few suggestions. Most are pretty traditional, like the items above – just lower in calories. Crudites and dip. Cut up some celery, carrots, cucumbers, and red peppers into bite-size pieces and serve with a nice dip. Cold cuts. We feel that some of the best cold cuts and sliced meats come from Italian markets. Just roll each slice up into a tube, or fold into a wedge, and arrange on a platter. Olive selection. Even simpler than cold cuts or crudites. While you’re at that Italian or Mediterranean market, pick up a nice array of olives – from savory to spicy, with different stuffings, from pimento to cream cheese to even almonds. Cheese bites and (wheat) crackers. Cheese platters do not have to be boring. There are so many cheeses to choose from – go for different textures and flavors – and then add some grapes and nuts to the platter as well. 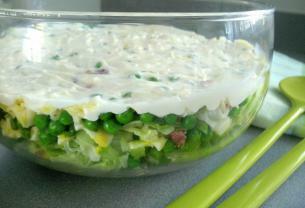 A crazy big salad. A big salad is the perfect complement to most game day foods – and relieves the guilt of eating all the other (heavier) snacks. Chop items small and throw it all in — vegetables, fruits, olives, boiled eggs, cheese, etc. — depending on your tastes. Top with balsamic vinegar, extra-virgin olive oil and a squeeze of lime. What’s a game party without some sort of sandwiches. Here are a few variations, some possibly unique to this article. Hot sandwiches. Serve spicy Italian sausage with plenty of peppers and onions, on crusty rolls. “Grilled cheese” burgers. You read that right. Make your burgers in one pan and keep it warm. 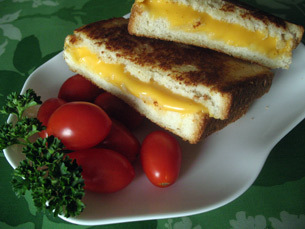 Then, on order, make a grilledcheesesandwich (shown above) in another pan, using regular bread slices. Split it open (careful, it’s hot) and place tomato slices, pickles (optional), and a cooked burger patty. Have hot sauce or ketchup on the side. Tex-Mex Cheese Burgers. Need I say more! Check out the video. Pocket subs. Whether you call them hoagies, rockets, subs or something else, these are always a hit, especially with kids. Make sure you have lots of small Italian buns or sub buns, a variety of cold cuts, pickles, toppings and spreads. These are for those colder football days, when you feel like something heartier. Perogies. Potato, onion and/or cheese perogies are so readily available in most supermarkets freezer section that you don’t need to make them from scratch. 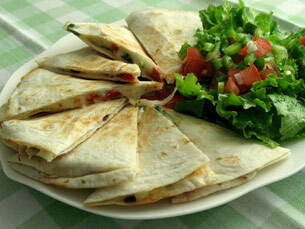 Serve with sour cream, salsa, dips, hot sauce. Pigs in a blanket. Don’t forget the kids in the snack list. We don’t know what it is about pigs in a blanket, but kids (and adults!) love them. BBQ ribs. You don’t need massive brontosaurus ribs like Fred Flintstone. Some regular sized, finger-licking, melt in your mouth slow cooked barbecued ribs will do just fine. Burritos. Beef and bean burritos are easy to put together beforehand or assemble on the spot and who knows better how to make them then The Pioneer Woman! Chili. A great, hassle-free, “simmer in the pot until you are ready for it” game food like chili (video) is hard to beat. Chili is also an excellent make-ahead dish, freeing you up to enjoy the game while it simmers. Meatloaf. Meatloaf isn’t particularly original, but if you like to get creative, you could shape it into a football. Calzones. While traditional calzones are delicious, this spinach and ricotta stuffed variation, flavored with a touch of nutmeg, is simply delectable. Buy prepared pizza dough to make it really easy. Pizza Loaf. This fast and simple-to-prepare pepperoni and cheese stuffed snack is sure to be a hit served with a bit of tomato sauce on the side for dipping. It’s a fair bit like calzones, but probably less work over all. Sweet potato fries. Be sure to pre-heat your oven for about 20 minutes to make sure that these baked fries come out crispy. Chicken kabobs. Kabobs are eaten in a number of countries across Northern Africa, Europe and South Asia. So you have many flavor choices for chicken kabobs. Or just buy some from the deli counter and throw them on the grill or bake in the oven. Samosas. These East Indian potato-filled pastries are said to taste great with beer – an alcoholic beverage of choice for football viewing. Making these from scratch is time-consuming. So just pick some up fresh from an Indian or Pakistani grocery store, or in frozen form from most large supermarkets. Now if none of these look tempting, check out Cooking Light’s list of Football Party Recipes! Some really good options in there !!! Of that entire list, the only thing I’ve never tried are “Beer Nuts”. What are they? Beer Nuts is a brand of snack foods building on the original product, peanuts with a “unique” sweet-and-salty glazing made to a “secret recipe”. you`ve probably had something like them. and no, they aren`t good for you ! Shucks! But they do sound delicious! This is so awesome! Thanks Kathy, you rock! Thanks for these delicious recipes! WOW a whole 32 snacks? That list is amazing and it seems that you are definitely passionate about cooking and especially for guests during sports.